This is a review of a split ep between U.S.A's Gloam and Peru's Obscure Evil which will be released in August as a joint effort between Blood Harvest Records and Helter Skelter Productions and we will start off the review with Gloam a band that plays a mixture of black and doom metal. Their side of the split starts out with distorted amp noises before going into a very fast musical direction which also uses a great amount of blast beats and tremolo picking which also gives the music more of a raw feeling along with all of the musical instruments having a very powerful sound to them. When guitar solos and leads are utilized they are done in a very melodic and technical style whilr the song also brings in a great mixture of slow, mid paced and fast parts as well a s the slower sections of the song adding in elements of doom metal, the production sounds very powerful while the lyrics cover death, magick, sorrow and hatred themes. In my opinion Gloam are a very great sounding mixture of black and doom metal and if you are a fan of those musical genre, you should check out this band. Next up is Obscure Evil a band that plays a mixture of black and thrash metal. 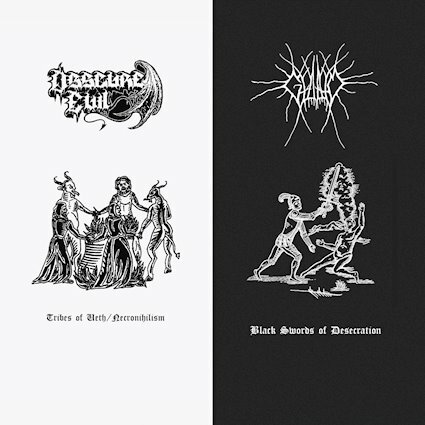 Their side of the split starts out with some ritualistic synths before adding in some dark and melodic guitar leads while the faster sections of the song also bring in a great amount of blast beats along with the vocals being mostly grim black metal screams and the music also mixes in a great amount of thrash elements, the production sounds very old school while the lyrics cover Abstractionism, Satanism and Nihilism themes. In my opinion this is another great sounding recording from Obscure Evil and if you are a fan of black and thrash metal, you should c heck out their side of t he split. In conclusion I feel this is a very great sounding split and would recommend it to fans of the many different styles of black metal. 8 out of 10.